I have a big fondness for glass. 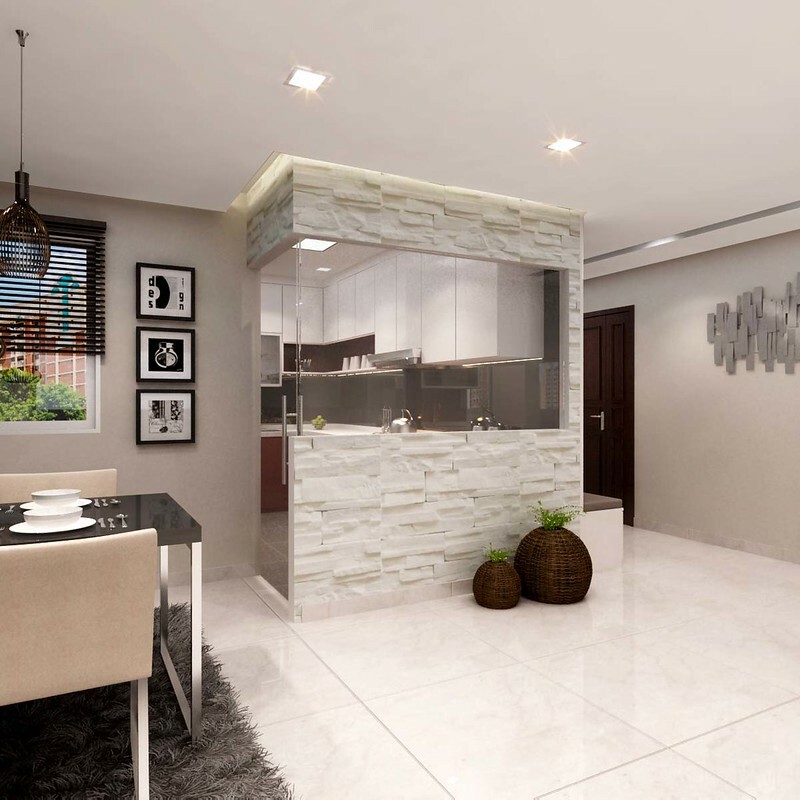 Glass wall, glass panels, glass table, marble floor…with endless possibilities of implementing glass elements into the interior designs, it is so easy to style and create a luxurious and beautiful home, giving a light and airy feel. Addition of glass walls or dividers can help to allow more natural light into the room which can create a lighter atmosphere and visually enhancing the space in the room. On top of that, adding glass furnishings can help to create a uncluttered feel due to their transparent lines which can prevent interruption of the eye and causes it to perceive a less cluttered space. Here, I have handpicked 5 of my favorite home ideas from Interior Design Singapore, which implement glass elements, that create such spacious and stylish home designs. I love how the glass wall beside the dining table actually helps to make the whole living room look very spacious. With the addition of the plant decorations and beautiful light decorations, it certainly helps to brighten up the room, reflecting the whole environment. The use of light tone color also help in creating a vibrant and comfy environment, a great place for relaxation after a long tiring day. Glass designs are very versatile. If you want to go for darker tone instead, it is still possible to implement glass elements as well. The key importance is to provide as much lighting as possible to ensure that it will not be dark and gloomy. I love how this project make use of light decorations like the false wall lighting, and bold patten wall (behind the television) to create lovely decorative accents to pair with the glass wall, making the whole room looking so classy and luxurious. I love how the designer actually implement glass and mirrors almost everywhere here while maintaining the simplicity theme. From the mirror on the wall to the glass dividers and glass furnishings, it certainly bring the whole room into top notch, creating a rich feel, despite such a simple and monochromatic design. How about creating a “spacious and open” kitchen concept? Glass walls are great substitute if you are looking for an “open” concept kitchen but yet still prefer a close environment to keep the cooking smell within the kitchen. This project demonstrated how glass door and partial glass panel can be implemented, paired with partial brick accent wall to create a neat and stylish look. Adding the clear glass panels helps to create illusion of space, as well as allowing natural light to come in. Want some privacy? Add partial walls like how the designer add the partial brick wall to the design. Another “open” concept kitchen design example using glass door and panels where the designer insert full panels instead of partial panels as seen from the previous example. This helps to create an even more spacious kitchen, allowing more natural light in which can visually enlarge a small kitchen. By using glass instead of walls, you can help to create an open kitchen while keeping the smoke from the cooking within the kitchen. Disclaimer: All pictures are taken from Interior Design Singapore unless stated otherwise. However, content and opinions are of my own. A self-taught artist who loves to blog about her lifestyle, arts & crafts, weddings, home décor and food. Dining Table or Wall Portrait?